Fluxbox in its default configuration showing the Configuration menu and two terms joined together by tabs very similar to those in PWM. 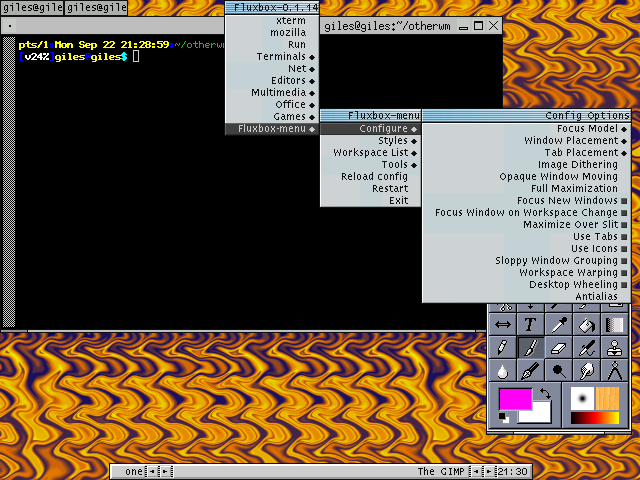 Fluxbox with the "qnx-photon" theme (or "Style" as it's called in Fluxbox) showing the Styles menu. I used 0.1.14, the latest version at the end of September 2003. The man page is extensive and very good. No shaped window support, but there are quite a few themes (which Fluxbox calls "Styles") and the look can be quite nice. It's theme-compatible with Blackbox. Fluxbox is a fork of the Blackbox code. 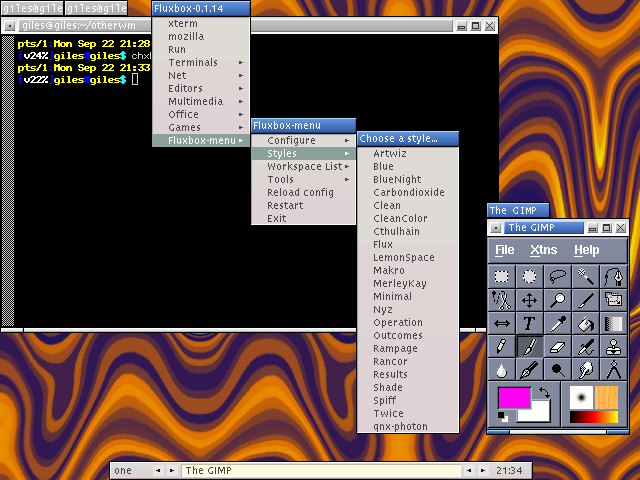 They've added quite a few things that Blackbox didn't support at the time of the fork, such as KDE support, partial Gnome support, configurable titlebars, tabs (borrowed from PWM, although these tabs are in addition to the titlebar whereas PWM's tabs are the titlebar), and internal support for setting your own key combinations. Fluxbox is theme-compatible with Blackbox. I appreciate the internalization of the keymapping: Fluxbox uses no more memory than Blackbox, and doesn't require a large external program to map keys. Tabs. Simple but attractive appearance. Small. Tab sticks above window frame instead of being part of it, wasting space. Can't move window by dragging tab, only titlebar. Not Xinerama-aware. The IRC channel seems to remain active.